This handsome, eye-catching watch comes with a genuine leather strap. A date calendar function plus a rotating bezel/timer circles the scratch-resistant crystal. 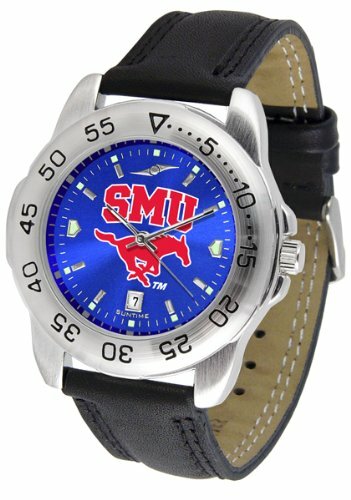 Sport the bold, colorful, high quality NCAA Southern Methodist (SMU) Mustangs logo with pride. The AnoChrome dial option increases the visual impact of any watch with a stunning radial reflection similar to that of the underside of a CD. Perceived value is increased with the AnoChrome's gem-like saturation of team color. Even the emblazoned school logo is enhanced by intertwining with AnoChome's intense luster. Just imagine a watch face this alluring surrounded by the superior quality of a timepiece.